There were 324 press releases posted in the last 24 hours and 153,408 in the last 365 days. HOUSTON, UNITED STATES, April 25, 2018 /EINPresswire.com/ -- Supply chain optimization remains a top priority for organizations trying to cut operational cost, sustain business growth and increase customer satisfaction. Major factors such as low supply chain visibility, shortening product life cycles, high warehousing costs, inefficient supplier networks, ineffective forecasts, and changing customer demands are making supply chain optimization a challenging task for enterprises. Deploying supply chain analytics solution help attain top-line growth, enhance profitability and increase market share by receiving key insights that further help end-users make data driven decisions, and provides an integrated view of the supply chain. Supply chain analytics is an innovative technology, which is implemented by industries to save cost, augment business growth, and increase customer satisfaction. Need for better supply chain visibility, reduced warehousing costs, changing customer demands and forecast is encouraging the demand for supply chain analytics solutions. Several organizations are implementing solutions to achieve high productivity and enhanced supply chain visibility. 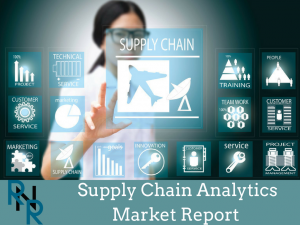 Supply Chain Analytics market research is an intelligence report with meticulous efforts undertaken to study the right and valuable information. The data which has been looked upon is done considering both, the existing top players and the upcoming competitors. Business strategies of the key players and the new entering market industries are studied in detail. Well explained SWOT analysis, revenue share and contact information are shared in this report analysis. Supply chain analytics market is growing at a rapid rate and is being pushed by various growth drivers such as the enormous rise in the volume of data generation in the business organizations across numerous industries such as retail and CPG, healthcare and life sciences, manufacturing, high tech and electronics and others, and rising awareness levels in the business organizations regarding the benefits of the supply chain analytics solutions. The market is also forecasted to thrive in the near future leveraging numerous opportunities in this market space such as the growing adoption trends of the mobile application-based solutions. This market is however forecasted to be hampered by a few factors such as the prevailing data security concerns associated with the cloud-based solutions. Various factors are responsible behind the market’s growth trail, which are studied at length in the report. In addition, the report lists down the restraints that are posing threat to the Global Supply Chain Analytics market. It also gauges the bargaining power of suppliers and buyers, threat to the new entrants and product substitute, and the degree of competition prevailing in the market. The influence of the latest government guidelines is also analyzed in detail in the report. It studies the market’s trajectory between forecast periods. The report is presented in a clear and concise manner so that readers can understand the market structure and dynamics effectively. Recent trends and developments in the global Supply Chain Analytics market have been analyzed. Opportunities leading to the growth of the market have been analyzed and stated. The report focuses on the global market, and answers some of the most critical questions stakeholders are currently facing across the globe. Information about the size of the market (by the end of the forecast year), companies that are most likely to scale up their competitive abilities, leading segments, and challenges impeding the growth of the market are given. • Market Penetration: Comprehensive information on the product portfolios of the top players in the Supply Chain Analytics market.